Time to walk but a target is needed and Von’s is it… Paul needed banana’s, chocolate chips, and assorted chopped nuts! OMG! What for you ask! Well, the latest Food Magazize has a receipt Paul wants to try. What could it be? A Banana Boat! Using a small paring knife carefully slice a banana peel from top to bottom. Open up the peel like a pocket. Place the chocolate chips and chopped nuts in the banana. Marshmallows are optional!. 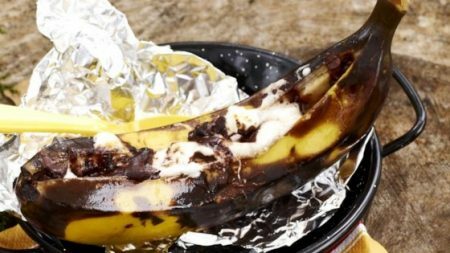 Gently fold the banana peel back in place, wrap the banana in aluminum foil and cook over the coals for about 10 minutes. We can hardly wait to try it! Paul headed to the market and wine store and captured the necessary weekly supplies! We worked around the house pretty much relaxing and then watched some TV before crashing! This entry was posted in Gardening, Just Us and tagged Chores, Just Us. Bookmark the permalink.